You might think that by now, every useful take on how a blogging platform should work had been explored but just over one year ago, in October, 2013, a new, free, open source blogging platform was launched following a successful Kickstarter campaign (which I backed) which raised £196,362 from 5,236 backers on a £25,000 goal. The platform is called Ghost and it is quite brilliant. Now, I love WordPress, the granddaddy of blogging platforms, and I’ve used it for all sorts of projects over the years but Wordpress is not for everyone. The reason? Wordpress has been around for 11 years and, as most system under continuous development do, over that time it’s gathered some “cruft”. For example, plugins don’t integrate with the menu system in a consistent way, some themes aren’t compatible with the latest release of Wordpress for some time after its release while some plugins take even longer or never get updated, and the editor takes a weirdly nannyish approach to raw HTML and inserts its own markup usually where you don’t want it. That said, the sheer richness of the environment allows you to create very ambitious blogs and even full-fledged e-commerce sites. In fact many people use WordPress not as a blog but as a content management system (CMS)! But if you don’t want to deal with that level of complexity — if you just want to blog — then WordPress may be more platform than you really want to deal with and that’s where Ghost comes in. Designed from start to be minimalistic, fast, and, for want of a better word, “sleek”, Ghost has achieved just that. 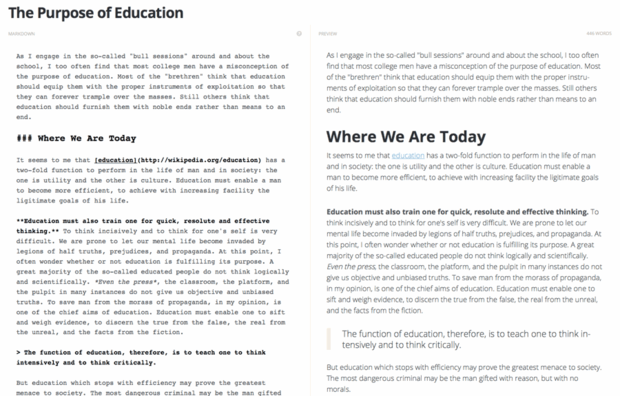 For example, Ghost has a two-panel editor so, unlike WordPress’s editor, when you enter text in one panel you can immediately see what it will look like in the other. In contrast in Wordpress the “Visual” view in the editor is a simple interpretation of the HTML so you have to save and preview content to see how it’s really rendered by the currently selected theme. A nice feature of Ghost is that its themes and dashboard (which are based on the Handlebars templating language) are, by default, fully responsive (they adapt their layout automatically to whatever device they are run on). The number of custom themes for Ghost from third parties including companies such as WooThemes, Themeforest, MarketPress Envato (all major players in the WordPress market) has been growing steadily and platform development has continued with the current stable release, version 0.5.2, being released on September 25, 2014. Want to try Ghost? You have lots of choices: [Corrected: Ghost.org offers hosting of Ghost blogs for as little as $10 per month for up to 25,000 views (Ghostify.io also offered hosted Ghost blogs but they're currently not taking on new customers for no stated reason)] or you can run up a Bitnami auto installer for Windows, OS X, or Linux or a virtual machine image or in their managed cloud service. Want more choices? You could use the Digital Ocean Droplet from Digital Ocean or install it on your target platform yourself (you’ll need to first install Node.js). If you’re interested in blogging and have yet to experience Ghost you’re missing out. This has to be one of the most powerful and best engineered blogging platforms ever.